For years, Wisconsin has been a bountiful state for community banks and other lenders to offer mortgage loans to farmers, businessmen and families looking to start their lives in beautiful new homes. At SAMCO Appraisal Management Company, we love to see banks and lenders like this succeed, and we know that one of the best ways to continue that success and growth is with high-value loans. If you’re interested in getting more value out of your loans with affordable and highly accurate evaluation and appraisal, contact SAMCO. We are the Wisconsin appraisal management company with the knowledge and experience in the Wisconsin market to give you just the boost you need when trying to build your high-value loan portfolio. Traditionally, Wisconsin mortgage rates have been higher than the national average, but that is no longer true. Mortgage rates have been progressively dropping in Wisconsin, so that now Wisconsin is more in line with average lending rates across the country. You will find Wisconsin conforming loan limits to be fairly consistently average, while FHA loan limits have greater variability. All of this makes it more important than ever that community banks and other mortgage lenders work with the best appraisal management company in Wisconsin they can find. There are many great real estate opportunities in Wisconsin, from agricultural ventures to business projects to residential properties, but margins for success are tighter than ever, and the last thing you want is a compliance error putting your loans or your company at risk. For these reasons and more, you will want to choose SAMCO as your Wisconsin AMC. There are many things that go into a successful bank or lending institution, but if your loans aren’t working, all the rest of it can collapse like a house of cards. 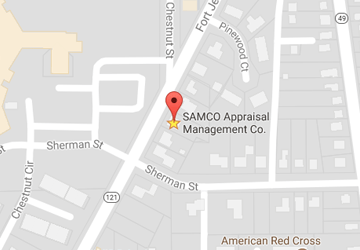 SAMCO Appraisal Management Company is your main line of defense against that happening. We will help you expand your portfolio of high-value assets while helping to make sure you stay in Federal compliance. With SAMCO working as your Wisconsin AMC, you’ll be confident that there will be no compliance issues between appraisers and loan officers, as they will never know who each other are and never meet. You can be confident that we will find you the most honest and accurate Wisconsin appraisers, so you know exactly how to construct your loan. You will save time and money and enjoy full appraisal independence when you take advantage of our Wisconsin mortgage valuation products. From agricultural loans to commercial to residential, we have the tools to help you succeed, including customized appraisal management programs and reporting with real-time data. Don’t let the market dictate the success of your community bank or local lending institution in Wisconsin. Take control with top-of-the-line appraisal management services. When it comes to professional appraisal management, you won’t find a better choice than SAMCO. We will make sure you meet USPAP requirements with a scored review and make sure you get the most accurate evaluations and appraisals possible. Partner with us and leave all your appraisal concerns behind. To get started, please get in touch with us using our contact form, email or by phone now.